All right. 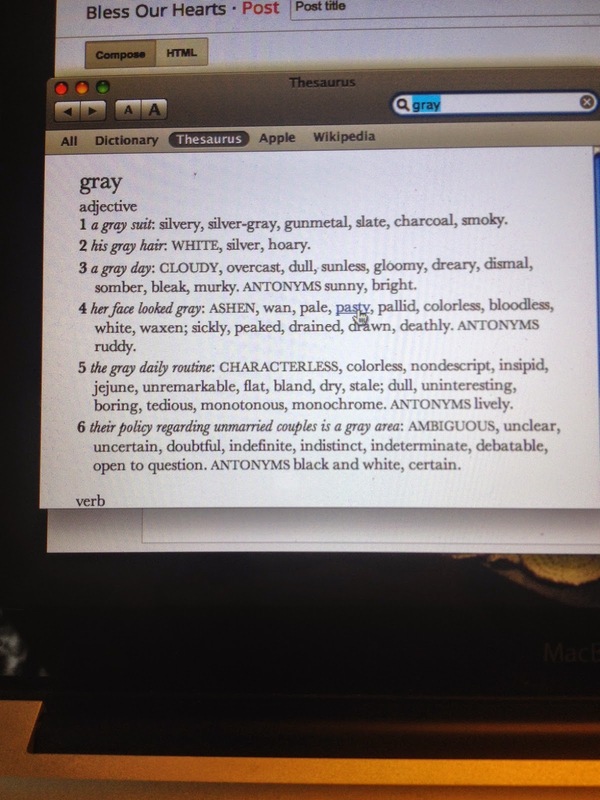 I have to come up with another word for "gray." I've overused cement and pewter. All of that. Especially the part about "the gray daily routine." I better go take a walk while it is not-quite-raining. In this cloudy, overcast, dull, sunless, gloomy, dreary, dismal, somber, bleak, murky day. There really is nothing nice about that word. I hope you walk was enjoyable. You were on my mind to today and were in the first sentence of my post today. You are amazing. That is all. Gray day and all. ditchingthedog- It was amazingly so. Gradydoctor- You honored me today. That was a beautiful post. the gray days were not around over the last few days. And I enjoyed every minute of the sun on the boat.